After what they referred to as "last summer's revelations", nodding to whistleblower Edward Snowden's leak, Google has ramped up encryption for Gmail. Since 2010, Gmail has used an encrypted HTTPS connection to connect your device to their servers. Now every message will also be encrypted when moving between Google's data centers around the world. 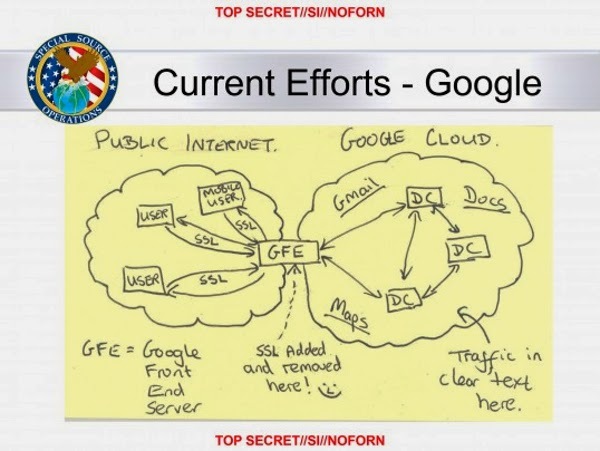 Leaked document indicating the NSA's methods of accessing Google. One of the ways the National Security Agency (NSA) was able to breach security measures was to intercept messages as they moved between data centers. Previous emails were not encrypted during these transfers. This new measure to increase privacy should thwart at least one of the methods the NSA has in it's arsenal for accessing email messages. Google claims that "no one can listen in on your messages as they go back and forth between you and Gmail’s servers—no matter if you're using public WiFi or logging in from your computer, phone or tablet." Nicolas Lidzborski, the Gmail Security Engineering Lead, said on Thursday that increasing email privacy and security is "something we made a top priority". He also went on to mention that Gmail was available 99.978% of the time in 2013. While Google did not mention anything about other services such as Drive or Calendar, they seems to be heading the charge in the fight for privacy, especially in comparison to Microsoft, who recently accessed Hotmail accounts to identify an intellectual property leak.